Here at Alfresco, my colleagues have been playing around with Aurora too – actually Alfresco is mentioned as a partner on the announcement article above, so ‘playing’ is probably not the right word ;-). But anyway, the noise I’ve heard coming from that team has been quite positive. Since we’ve just published the results of running our performance benchmark on (amongst others) Oracle on Amazon RDS, trying out the benchmark on Aurora was a no-brainer. I’ve added the benchmark results to the sheet of the previous performance blog post: https://docs.google.com/spreadsheets/d/15wK7dQfgChz-9XF1qYi0qMnNoRWp4FQQr6XTYHXTHEE/edit#gid=739564290. The sheet compares the numbers from Oracle on RDS vs Aurora on RDS. So here’s what we saw: when using just a single thread, the numbers weren’t that clear. 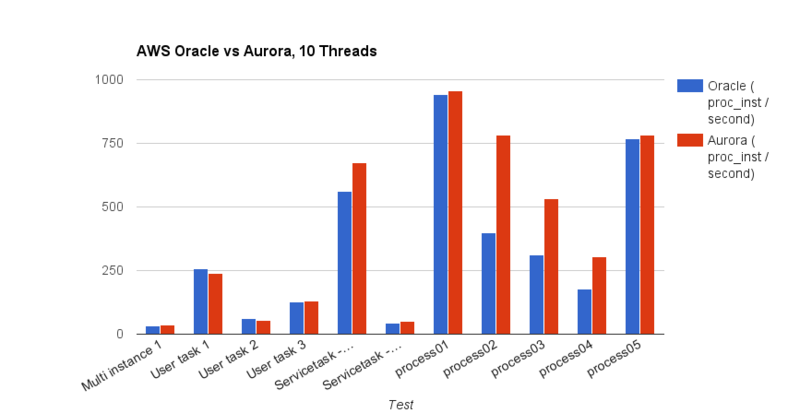 Half of the use cases performed better on Oracle, the other half better on Aurora. On average, Aurora was 16.96% faster for the same benchmark on Oracle. However, our test with the most data (service tasks vars 02), which is hard to see on the chart due to the scale, performed 50% better. When we add more threads to the system to execute processes, we see a clear pattern arise. The more threads we added, the better the results for Aurora became. 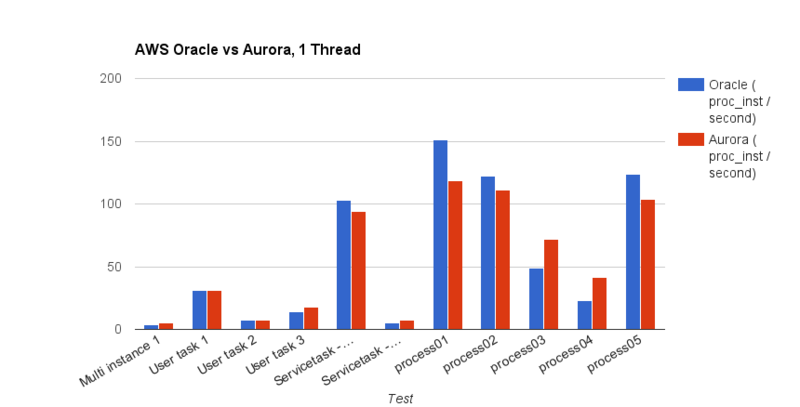 With ten threads (the most we tested), Aurora is faster in all but two cases (which does makes me want to check upon those tests, cause they are measured in a different way), and in general 25% faster. Although we didn’t got the five times performance improvement from the marketing announcement (EDIT 31st July 2015: as pointed out in the comments below, the ‘up to five times’ is for MySQL and NOT for commercial databases. Which matches what we saw. ), I was genuinely surprised that, with the same hardware and setup, Aurora is 20% faster on average with outliers up to 81%. Also note that our benchmark is really write-intensive, where Aurora makes setting up read replica’s a breeze through the AWS console. So probably for other benchmarks, with a bit more reads, Aurora can shine even more. Also cost-wise, Aurora is interesting. I checked the bill: Oracle was about 1.96$/hour while the Aurora machine I was using is advertised at 1.28$.hour (couldn’t verify, as it shows as 0$ on the bill currently … maybe a promotion?). So more performance for less money … who doesn’t like that! Hi Joram, it is always interesting to see performance runs on real-world applications. Thanks for posting them. As a clarification, when we said up to 5 times faster, we were comparing to MySQL, not Oracle – in the PR, it says “Amazon Aurora can provide up to five times better performance than the typical MySQL database”. Our comparisons to commercial databases are more on availability and durability. @Anurag: First of all, congrats with the public release of Aurora, impressive stuff! Thanks for clarifying that, it matches my experience of using Mysql for sure. I will edit my post to point people towards your comment. Better performance for the same use case for less money than Oracle… you have my vote.